Questions, we all have them - especially when we're dealing with companies we've never dealt with or products we've never purchased. We certainly can't answer everyone's questions here, but below are some of the more commonly asked questions (or some variations of them) which we've receive during our years of handling normal phone and email inquiries. The answers below may make ordering from us easier and give you more assurance of what you can expect from us. As for the ones we haven't answered, well, those we'll be happy to answer directly when we hear them from you. Can I see what I'll be getting? 1. Yes, absolutely. All we'll need is your email address. 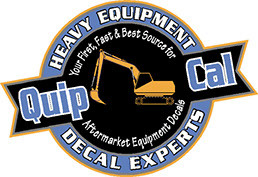 We can then email you digital images of the decals you'll receive in a particular set. Are these decals correct in size and appearance? 1. You'll be able to see the appearance of the set when you request an image of that set. more graphically complex sets we do not guarantee a perfect match to the original but strive for an great quality representation. What is the quality of the material and the process? 1. Decals you'll receive are produced using one of two basic process. Some are cut from vinyl. Others are printed on vinyl. Many are a combination. 2. All material used on cut vinyl graphics is rated for 7 years under normal conditions and in typical environments. 3. All decals which are printed are printed on 7 year rated vinyl and produced with a print process rated for 5 years in normal environments. 4. Generally, we say that the machine will need to be re-painted by the time the decals need replacing. How can I actually place and pay for an order? 1. Orders can be placed and paid for either directly over the phone by providing your shipping and payment information. 2. If you would prefer - and if we have your shipping information and email address, we can invoice you through PayPal. 3. Repeat customers for whom we have both current payment and shipping information can simply email in orders? When can I expect to receive my decals? 1. Most orders are produced and shipping within 24 - 48 hours from order date. items in the order are needed most quickly. If we must ship a partial order we'll be sure the most critical needs are shipped first. packages and very small marking sets are also often shipped by U.S. Postal service in order to save you money. ordering if you have a critical deadline for receiving your decals. reason we do not accept returns or order cancellations. It might be weeks or months before we'd receive another order for the exact same set. 2. If, for some reason, you receive decals which are not sized correctly, we will certainly exchange those for decals of the correct size or quantity. How are these decals installed? 1. This is actually two separate questions. We have a several written and video tutorials devoted to installation in the Easy Installation page.